Even though it was spring break this past week, we decided to extend winter a little bit longer! 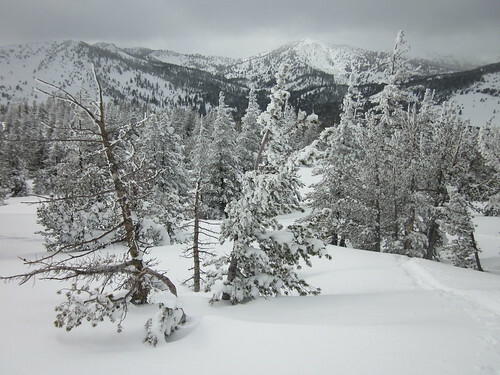 After getting news of the non-stop snowfall that the Sierras were getting (and are still getting), we decided to go skiing and snowshoeing at Lake Tahoe. Technically, its the first week of spring, but it still looks like it's winter in Nevada! 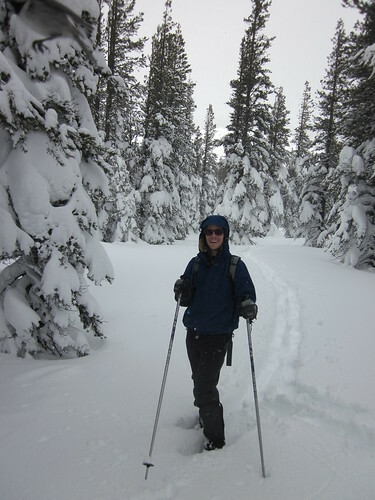 On the first day of our trip, we went snowshoeing on the northwest side of the lake, in Nevada. We had a brochure of the Tahoe Rim Trail, a trail which you can hike (during summer) all the way around Lake Tahoe. We looked for a place where it intersected a main road (Hwy 431) and drove there to get on the trail (now under many feet of snow) to go snowshoeing. Usually, big trails like that have parking areas or large pull offs, so it was our best bet to find a parking place off the highway. When we got there, there were already a bunch of cars, so we knew it would be ok to park and leave the car. Once we got our snowshoes on, we headed off into a large meadow. The trees are frozen, covered by an icy snowy frost. A close up of the frozen branches of a tree. We didn't trek through the open field either. 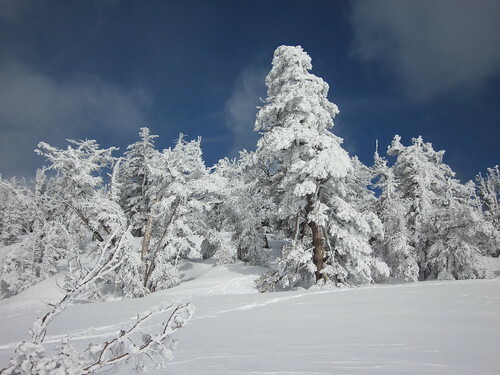 Instead, we headed off into the forest, where we climbed steadily uphill through snow covered pine trees. We heard many birds singing in the forest. When we took a water break, all of a sudden a bunch of small song birds flew around us and landed in the trees we were stopped next to. Some of them were very curious, and started swooping down at us, flying at our heads and straight towards our face! At first we thought that they were angry at us, so we moved on, thinking that we should have our water break next to another tree. So we trekked a bit farther, to another tree. But the birds kept following us. And they kept swooping and flying at our heads! What was going on?! Then Romy decided to start waving his pole at the birds, to see if they would attack the pole instead. They weren't afraid of the pole! Instead, they just flew and sat on it! Then Romy put out his arm to see if they would land and sit on his hand. To our amazement, they flew right into his open hand! They just did it for fun or something, because we didn't have any food or anything a bird would want, except a place to land. 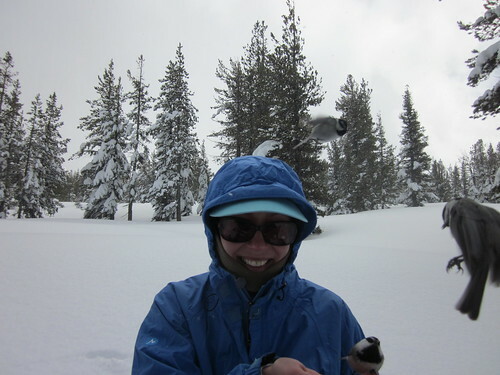 Mountain Chickadees flying at and landing on me. After the initial excitement of wild animals being all friendly, we decided we should keep moving, since we came here to go snowshoeing, and not bird watching. So we kept going, and soon found another snowshoe-er's tracks, which we followed, since breaking our own trail in the deep fresh snow was getting a little tiring! The trail started to climb pretty steeply, and after a while, we were getting so tired we decided to take a lunch break. We weren't used to all this physical activity at about 8,500 ft in elevation - we just came from sea level in Oakland! 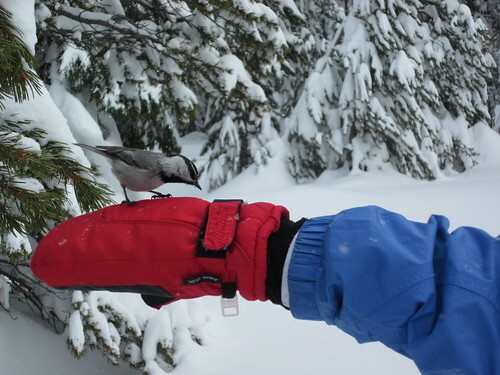 A chickadee on my glove! As soon as we sat down in the snow, the flock of chickadees were back. They followed us all this way! Now they weren't afraid at all anymore. They were landing on our heads, shoulders, hands, where ever! When we opened up our backpack, and took out our fruit and power bars, they were all over us. It was hard to eat, because as soon as you exposed a portion of your bar, there was a chickadee on your hand pecking at it. Maybe they are so friendly because they know hikers carry food! The weirdest thing was how crazy they were for our dried banana chips. They loved those more than our granola bars. Weird! After we were done eating, they still hung around, swarming us. It was a lot of fun being surrounded by them, singing and flying from one perch to another, but we were getting cold sitting in the snow, so we got up and started trekking further up the mountain. A movie of chickadees landing on Romy's hands. As we neared the top, we saw Lake Tahoe come into view below us. The wind started to blow and some of the snow clouds were clearing up over the Lake. We looked around to see if we could get to a higher place for a better view. Then we saw a distant small peak, which had a bunch of icy covered trees. We started heading for it. This time the slope was so steep, we had to put our heel bars up on the snowshoes so we could climb better. Finally we got to the top, and now we could see the whole of Lake Tahoe, around the whole shoreline! We didn't even know that we would be able to get this view when we started the trek! A movie of chickadees invading our lunch break! I guess we were really high up and pretty exposed, because the chickadees no longer followed us. 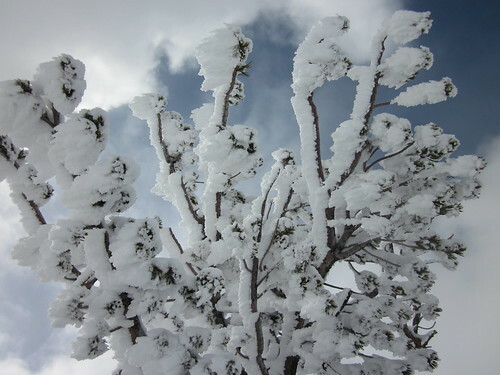 All the trees were covered by a coating of frozen icy snowy frost that was wind blown onto all of the branches. It made the trees look really white and frosty. Since we were at the top, we decided to take a break before going back down. The sun started to come out and shine on us, so it wasn't that cold anymore. When we checked what time it was, we didn't realize it took us so long to get up there (since we took so many breaks to play with the birds). We decided it was best to start heading back down, since we still had to drive to our motel, which was in South Lake Tahoe. 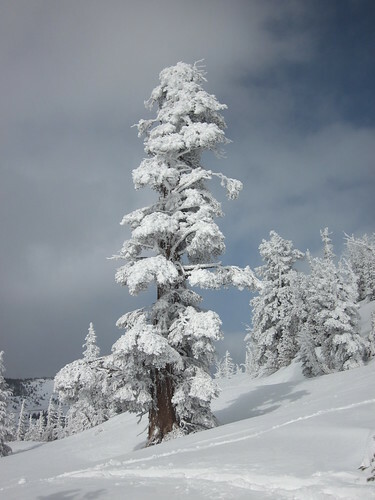 A pic of Romy snowshoeing. On the way down, we found the steepest way and ran down, trying to ski with our snowshoes. It was pretty hard to do, since the snowshoes don't easily slip and slide. It took us almost an hour to get back. When we returned to the lower elevations, we heard the chickadees singing again. We waved good bye to them, and headed towards the car. We'll never forget the crazy chickadees! Time To Get New Skis!